This High School Musical™ set features 29 pieces of dress-up fun, including a cheerleader uniform, pompoms, a headset and microphone, musical earrings, hairclips, photos and more. It all comes packaged in a colorful book-shaped storage box. 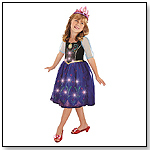 “We are the only official licensee of Disney’s High School Musical costumes and accessories. Our unique packaging, such as the High School Yearbook, is especially appealing to the specialty toy market,” Pat Cacciola of Rubie’s Costume Company told TDmonthly. By CREATIVE DESIGNS INTERNATIONAL LTD.